As 2019 begins, we look back on an incredible 2018 where we continued to make strides promoting the rich culture and heritage of the Sikhs and Punjab in the mainstream and look forward to what promises to be an even more eventful year. We wanted to take this opportunity to say a heartfelt thank you to you all! The patronage we have received from you and others has enabled us to make significant strides towards our goal placing the history, culture and heritage of the Sikhs and Punjab in their rightful place - namely on the global stage. 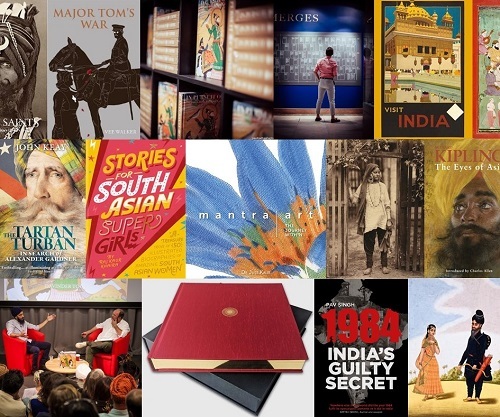 As a direct result of your ongoing personal support, Kashi House, the world’s only mainstream publisher focusing on the heritage of the Sikhs and Punjab, has continued to go from strength to strength. As a social enterprise with a passionate team of only two full-time members ably supported by a small core of dedicated volunteers, we’re mandated to reinvest all profits into current and upcoming projects. In the past twelve months we've published new books – some with the biggest names in their field – and curated the hugely successful ‘Empire of the Sikhs’ exhibition in London. As in previous years, our projects this year achieved critical acclaim in the mainstream media. The year kicked off with the launch of the paperback edition of John Keay's The Tartan Turban: In Search of Alexander Gardner. Having previously received critical acclaim and mainstream press coverage including in The Sunday Telegraph, The Times Literary Supplement, The Literary Review and The Spectator, the paperback edition was reviewed in The Week and chosen by The Sunday Times in February as one of their ‘Pick of the Paperbacks’. The accolades for The Tartan Turban continued as the book was shortlisted for the prestigious Elizabeth Longford Prize for Historical Biography. Thanks to the fantastic efforts of our trade sales agents, Allison & Busby, the success of this brilliantly written historical biography was wholeheartedly acknowledged by WHSmith who selected the book to be promoted at their stores at major airports and railway stations across the UK. John Keay was invited to give a talk about the enigmatic Colonel Gardner at the Palace of Holyroodhouse in Edinburgh, the Queen’s official residence in Scotland. The colonel finally made his way home to the USA when John Keay was invited to discuss the life and travels of Alexander Gardner at the New York and Boston chapters of The Explorer’s Club. In February, when Canadian Prime Minister Justin Trudeau and his family visited the Sikhs' holiest shrine, the Golden Temple of Amritsar, he was gifted with a copy of our celebrated The Golden Temple of Amritsar: Reflections of the Past (1808-1959). Trudeau was clearly taken aback by the shrine and we hope he and his family enjoyed the copy of possibly the greatest Sikh gift book ever created! March saw Charles Allen, an authority on Rudyard Kipling, give a talk on the author’s last work on India The Eyes of Asia at the National Army Museum in London. The diverse, engaged audience heard Charles discuss Kipling’s fascination with Indian soldiers and how his views changed and developed during WW1. The summer ushered in two of our most ambitious projects ever undertaken. 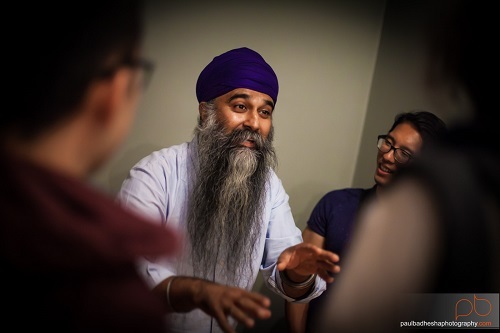 The hugely successful ‘Empire of the Sikhs’ exhibition for the UK Punjab Heritage Association (UKPHA) launched at the Brunei Gallery, SOAS in central London on 14 July. We simultaneously released the fabulously researched and illustrated In Pursuit of Empire: Treasures from the Toor Collection of Sikh Art by Davinder Toor. 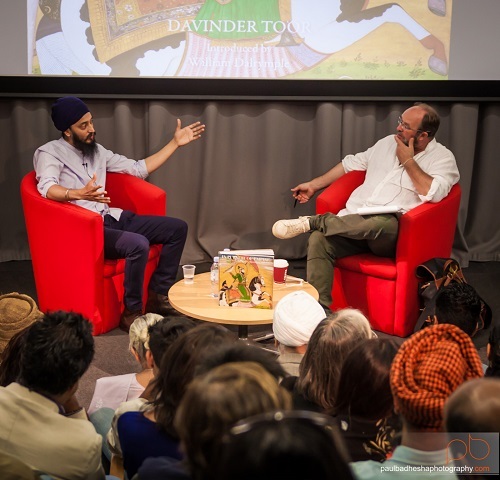 A compelling launch event saw Davinder, the world’s leading collector of Sikh art and artefacts and the primary lender to our exhibition, in conversation with acclaimed writer and historian William Dalrymple, who wrote the introduction. The book served as the perfect accompaniment to the exhibition, shedding further light on many of the wonderful artworks and objects on display. The Special Limited Edition of the book was also launched for avid collectors and those who wish to show extra support for our work. Available exclusively from our online shop, it comes with distinctive scarlet premium cloth cover elegantly debossed with gold- and silver-foiled emblems of war found on battle standards of the Sikh Empire. The book is beautifully presented in a deluxe clamshell box encased in premium design paper beautifully foiled in gold and black. The Special Edition, limited to just 500 copies, not only makes a perfect gift, it also allows us to re-invest more profits back into new projects. Over the course of the summer, the exhibition received close to 30,000 visitors drawn in by national media coverage most notably in The Times and BBC Radio 4. 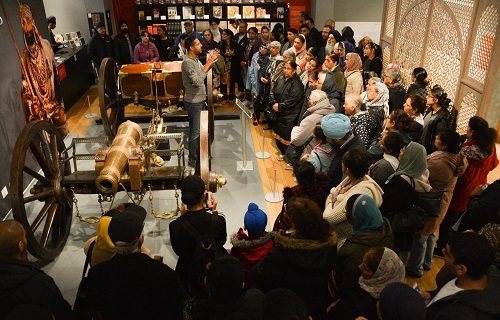 They learnt about Maharaja Ranjit Singh, the cosmopolitan Sikh Empire and the many Europeans who served it with over 130 dazzling objects displayed. The experience was brought to life for visitors with insightful curator-led gallery tours and evening talks delivered by experts, including members of the Kashi House team. Many went home loaded with books, art prints and merchandise as a lasting reminder of their memorable experience, including the new ‘Empire of the Sikhs’ print set. For those who wished to explore Sikh cultural heritage further, a series of 13 illustrated talks delivered by world class experts were organised covering a range of diverse topics from dancers at the Sikh court to the patronage of Persian manuscripts. It ranks as the third most visited show in the Brunei Gallery's twenty-year history and was a finalist for Best Live Event at the national Asian Media Awards. September saw the launch of our first novel, Major Tom’s War by Vee Walker at the National Army Museum. The captivated audience were treated to Vee discussing her book with actor and presenter Jassa Ahluwalia, including two gripping readings. Relying on family archives and set during WW1, the novel explores the relationship between Vee’s grandparents, Tom Westmacott and Evie Winnington-Ingram, alongside a number of compelling characters, including Sikh soldiers, set against the grisly events of the Great War. Vee Walker discussed her debut novel on BBC Radio 5 Live and then appeared on the same show as Michael Palin on BBC Radio 4 Saturday Live. Following the cover reveal to our first children’s book in October, Stories for South Asian Supergirls, pre-orders immediately skyrocketed. The book made a dazzling entry on Amazon Canada, achieving top spot on the ‘Women’s Biographies for Children’ and third on ‘Hot New Releases in Women's Biographies’ just behind Michelle Obama’s autobiography, Becoming! Written by Raj Kaur Khaira, who launched the inspirational Pink Ladoo project to challenge traditional gender stereotypes, our first children’s book will contain 50 illustrated biographies of remarkable but under-celebrated South Asian women who have made significant contributions in their field or to society. The WW1 theme continued in the run up to centenary commemorations when Amandeep Singh Madra OBE, co-author of two Kashi House books – Warrior Saints: Four Centuries of Sikh Military History (Vol 1) and The Golden Temple of Amritsar: Reflections of the Past (1808-1959) – joined Edward Stourton and Imam Qari Asim on BBC Radio 4 to discuss the role of Indian soldiers during the Great War. The year ended with notable public appearances by several of our authors. Pav Singh, author of 1984: India’s Guilty Secret, was interviewed on the flagship BBC World News channel - which has a global audience of approximately 100 million – following the conviction of senior Indian politician Sajjan Kumar for his role in the massacre of an estimated 8,000 Sikhs in November 1984. Two of our authors discussed and showcased their work in Singapore at the Naam Raas Kirtan Darbar event. 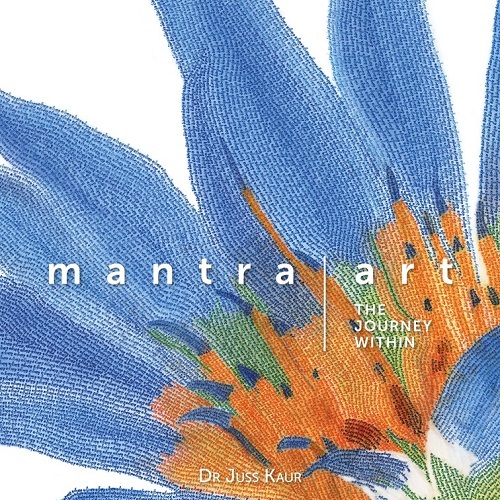 Davinder Toor spoke about his journey as a collector of Sikh art and objects while Dr Juss Kaur, author of our forthcoming book Mantra Art: The Journey Within, exhibited a body of spectacular artworks in support of the international humanitarian charity, Khalsa Aid. We're looking forward to delivering on an incredibly exciting publication programme of four new titles in the first half of the year alone. Watch this space for more on these titles, which will focus on women, history, meditation and mindfulness, and includes our first foray into children’s books. We are also planning to dramatically expand our offering of exquisite art prints. Finally, as part of our new social media strategy, we will be sharing themed images daily and lots of hidden stories. Be sure to follow and like us on Instagram, Twitter and Facebook!